On Labor Day, we pay tribute to the great achievements and contributions of workers throughout the country. With a thriving economy in the District, it is clear workers are critical to our economic growth. However, there is still much work to do to make sure that all workers benefit from the District’s prosperity. 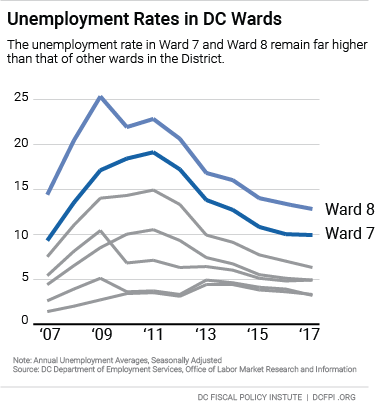 While DC’s current unemployment rate of 5.6 percent is the lowest it’s been since the beginning of 2008 – meaning that the city has recovered from the Great Recession – ward-level unemployment rates tell a different story. Over the last ten years, the predominately Black wards east of the river have not seen unemployment rates drop below 10 percent. In 2017, the unemployment rate was 10.3 percent in Ward 7 and 13 percent in Ward 8, compared with 4.2 percent in Ward 2 and 4 percent in Ward 3, which are predominately white. The unemployment rate for white residents in 2017 was 1.6 percent, while 13.7 percent of Black residents and 5.6 percent of Latinx residents were unemployed. For every white unemployed resident in the District there are nine Black and four Latinx unemployed residents. High levels of unemployment in communities of color reveal the need for equitable policies that remove employment barriers for all working aged residents. The city continues to outpace neighboring jurisdictions in employment gains and has seen a 13.5 percent increase in jobs since 2008. The largest employment gains have been in the following industries: leisure and hospitality (34.7 percent), construction (25.8 percent) and education and health services (28.1 percent). While job gains are a sign of a growing economy, a closer look at wages in growing industries show stark intra-industry wage stratification, another driver of inequality in the District. For example, the health care industry is growing significantly, and there have been large wage gains for physicians and other highly-compensated professionals, but wages are falling for workers in health care support, such as home health aides. The median annual wage for practitioners is a little over $75,000. In contrast, the median annual earnings of home health aides, who are also essential to the growing industry, are only $27,730. The District’s economy requires workers at every skill level, but for lower-skilled workers, it is becoming more and more challenging to make ends meet in DC. This Labor Day, we should reflect on how our economy can benefit all workers. Employment and wage disparities result from discrimination and high barriers of entry for low-wage workers and workers of color. Economic development works best when it works for everyone. High-quality job standards and a comprehensive workforce development system can help us achieve inclusive economic development. The employment and wage gaps are a powerful reminder of why we must continue to work to break down barriers to good jobs and encourage high-quality employment in the District.